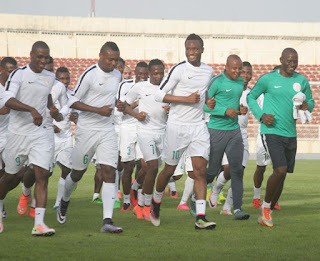 A total of 17 players are already in the Super Eagles Crowne Plaza Hotel, London camp ahead of their two international friendly games against Senegal and Burkina Faso on Thursday and Monday respectively. According to the Super Eagles official Twitter handle, the players who are currently in camp are new invited Tyrone Ebuehi, Noah Bazee, Isaac Success, Ogenyi Onazi and Carl Ikeme. Others players are Moses Simon, Shehu Abdullahi, Ahmed Musa, William Troost-Ekong, Kenneth Omeruo, Leon Balogun, Wilfred Ndidi, Kelechi Iheanacho, John Ogu Victor Moses, Alex Iwobi and Chidozie Awaziem. Meanwhile, despite reporting to camp, Moses will be excused from the two friendly games due to injury. The Chelsea star will be allowed to leave camp on Tuesday. The Super Eagles will face Senegal on Thursday inside The Hive Stadium, London. And on Monday, they will play Burkina Faso also at The Hive Stadium. Both friendly games are part of preparations for the Super Eagles ahead of their 2019 Africa Cup of Nations qualifier in Uyo in June.